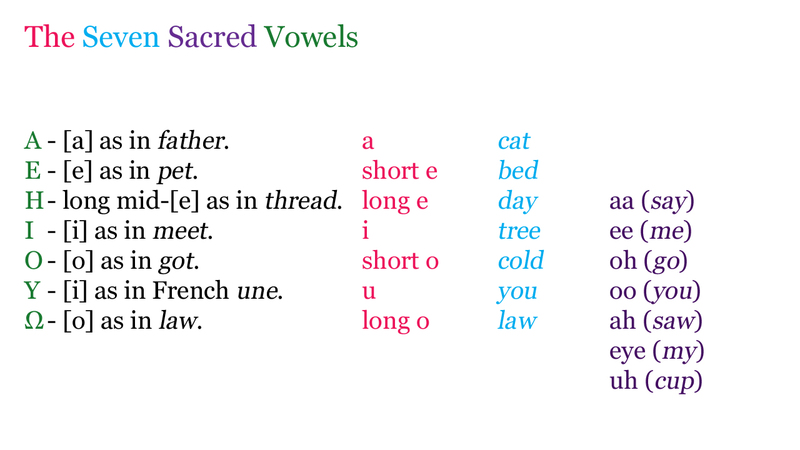 Having looked online to see what sounds are represented by the "seven sacred vowels" it appears there are various interpretations. For instance, the top two web pages that pop up when you do a Google search give the following slightly different results. I then came across the following list during a Google Image search. A - [a] as in father. E - [e] as in pet. H - [i] as in meet - but in classic Greek - a long open mid-[e] as in thread, but long. I - also [i] as in meet. However, in this case the classic Greek is also pronounced as in meet. O - [o] as in got. Y - again [i] like as in meet - but in this case the classic Greek is a rounded [i] as in French une. Ω - again [o] like as in got - but in classic Greek [o] as in law. Given that some of these vowels are duplicate sounds in the modern Greek it may be better to rewrite this list with just the classic Greek. After all, I guess the ancient sounds are what we're seeking anyway. So it would look more like this. H - a long open mid-[e] as in thread, but long. I - also [i] as in meet. Y - a rounded [i] as in French une. Ω - [o] as in law. Now we have all this it might be worth comparing these different variations. In fact, looking at the first two having learnt a bit more about the classic Greek it looks as though they're much more similar than I first realised. I think my main confusion stemmed from my assumption that the [i] in the first chart symbolised [i] as in igloo and not [i] as in meet. With this knowledge the tables are all sufficiently similar. I'll create a chart compiling all this anyway though just to get a more comprehensive view of what we have before I move onto the next article. The above chart shows the four internet sources I've looked at. The first column showing the classic Greek pronunciations, the middle columns showing the web page charts, and the fourth column showing the seven sounds as they appeared on an image I came across. As you can see two sounds from the final column didn't seem to correlate to any of the seven in the other chart. The eye sound as in my, and the uh sound as in cup. There's also a little bit of confusion regarding the upsilon [Y] sound. 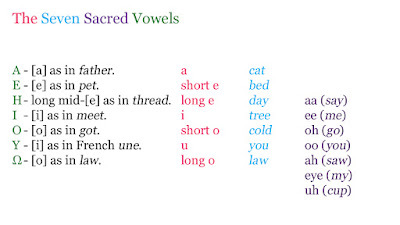 In the second column it's a [u] whereas elsewhere it's more of an oo sound, as in you. The [u] maybe could have a possible overlap with the uh (cup) sound in column four. I'll use this chart as the starting point for my next article, though I'm not quite sure where I'm going to go with it.